Jan 29, 2012 Posted by AAfterwit on Jan 29, 2012 | Comments Off on Rock For The Ages – The Idle Cure Edition. Rock For The Ages – The Idle Cure Edition. 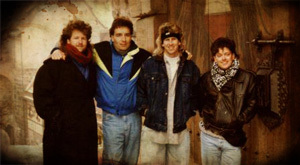 In 1986, the group Idle Cure came upon the scene in Contemporary Christian Music. The band was formed in Long Beach, California from former members of secular groups. What made the band great was while other bands such as Stryper had brought heavy metal into the CCM world, Idle Cure’s sound was heavy metal with harmonies. Sometimes compared to Def Leppard, the group released 8 albums over the course of 15 years, proving that God’s love of music does not depend on the style, but the heart and lifestyle of the men and women who play and sing it.